The books are always better! It’s a familiar refrain from many, including some of the Game of Thrones faithful who grew up on George R.R. Martin’s The Song of Fire and Ice series. Things inevitably get cut, people moved around, and Lady Stonehearts left in the ground, and it has been the case for HBO’s own adaptation for a few years now. In fact, the author has revealed a ballpark figure that would have been reached if the show faithfully followed the books to the letter. Game of Thrones season 8 wouldn’t have been even close to the home stretch, let me tell you. How does Game of Thrones season 13 sound? 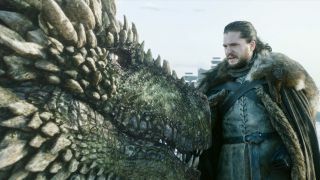 For die-hards who can’t get enough of Westeros, thirteen seasons would have been just the ticket, but Game of Thrones is very much its own beast at this point, having sped past the books and into brand-new territory. It just wouldn’t have worked with what was cut and left out. Martin explains that, to help showrunners David Benioff and Dan Weiss, he held “story conferences over several days” discussing major plot points past the books, with the writers then being able to use that as a starting point for possibly heading in another direction once the show outstripped the books. So, we’ve only got five Game of Thrones episodes left instead of 50 – and fans of the books can rest easy in the fact that their experience will be slightly different to the show’s overall arc – but it just goes to show how rich a world George R.R. Martin has crafted. We could potentially be leaving out a third of the detail and we’ll still be invested all the same. Want to re-live the new Game of Thrones season 8 intro? We've got it for you to replay over and over again!